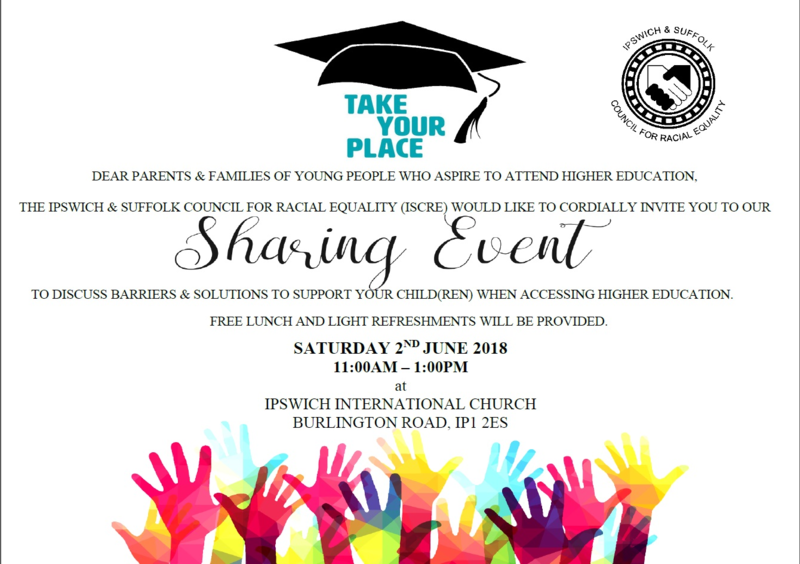 The Ipswich and Suffolk Council for Racial Equality (ISCRE) has been commissioned by the Network for East Anglian Collaborative Outreach (Neaco) to talk to parents and families of young people who are underrepresented in Higher Education. We are seeking to find out what the perceived barriers are and what would help the parents and families of these groups in supporting their children. where we will discuss our findings and co-produce ‘It Takes A Village To Raise a Child: A Parent’s Manifesto’, to provide schools, colleges, universities and HE providers with a simple guide to make HE more accessible and welcoming to young people and their families from underrepresented communities. We would like to extend an invitation to parents and families of young people who aspire to attend higher education. We look forward to seeing you there.